Question. How many 20-milers must you run in order to be successful at the marathon? Trick question. The answer is zero. In today’s interview, we’re going to debunk many of the marathon training myths prevalent in traditional marathon training plans. On our show this week is 2:14 marathoner and exercise physiologist, Luke Humphrey, and he’s here to discuss the training principles outlined in his new book, The Hansons Marathon Method. 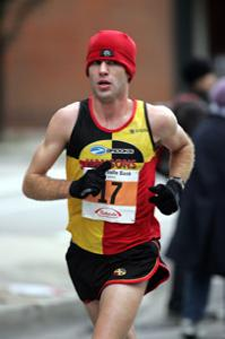 Not only is Luke an excellent runner himself, having qualified for two Olympic Trials and placing in the top 12 at the Chicago, New York City, and Boston Marathons, but he’s also been coaching runners since 2006 and has his Masters in exercise science. The problem with traditional marathon training plans. Specifically, Luke identifies who those types of training plans were written for and why it probably isn’t you. Why the 20-miler isn’t a magic number when it comes to marathon long runs. Not only does it make you too tired to run hard throughout the rest of the week, but research demonstrates long runs of over 3-hours don’t make you any fitter compared to those of 2-hours. The critical balance between speed, threshold, and aerobic running that enables runners to be consistent week after week, month after month. Some of the biggest training mistakes he sees in the runners he works with. Plus, some of the biggest mistakes he’s made in his own training. Luke went nearly 3 years without setting a marathon PR – and not for lack of training. He’ll reveal exactly what he did wrong and how you can prevent it yourself. If you’re starting to think about how to approach your next marathon training segment, you’ve got to listen to this interview first. After listening, let us know what lessons you’re going to apply to your training! Coach Jeff: Hi, everybody, welcome back to the show. I appreciate you taking your time to listen to us today. I’d say we’re very excited. We have Luke Humphrey on our show today. Luke is a 2-14 marathoner. He’s part of the Hansons Brooks Olympic Development Project. He’s been there and been running marathons for quite a long time. He’s qualified for a couple of Olympic trials. He is also an exercise scientist. Recently, he just published a book it’s called the Hansons Marathon Method. I have a copy of it here. This was released on Monday, just a few days ago. Luke’s going to be on our show today to talk a little bit about the book about some of the training principles in the book as well as — he is competent in zone running. Here to help me out and answer some questions. Luke, welcome to the show and thanks for taking the time out of your day to be with us today. Luke: Thanks for having me, Coach Jeff. Coach Jeff: I did a brief intro of kind of some of your background, but I definitely didn’t go into detail. Talk a little bit about you starting the sport, how you progressed. You obviously, from what I know, you weren’t a stud high school runner coming out. Tell us how you kind of progressed through the years and continue to get better. Luke: Yes, absolutely. I never was super fast in high school. I think I ran 10-0-2 I think was my 3200 meter PR, but believe it or not, I did run about 50-flat in the 400 and high 150s in the 800. That’s one of those things — I’m from a really small town. We had three guys on the team that did four events every meet no matter what. I’d be in 800-meter dash some days. It didn’t matter. Just go in there and see what you can do. But yes, it’s just fairly descent but nothing that really stood out and walked on it in Central Michigan and run for Craig Fuller there for five years. I got my degree in four and then did a — started Masters Program on my fifth year, and just went from there. Even in college it’s pretty average. We had some pretty good teams for cross-country at Central. We were sized ninth in the NCAA, one year in cross. We had a couple All-Americans. I was one of them, but we were in 29-17 a long time ago, but I think 29-17 in the 10K in my senior year. Okay, but again, nothing that really stood out. I think with Kevin and Keith, what they were looking for is they saw that I was going to run better as the distance got longer. That was definitely the case. I think that’s why they looked at somebody like me. Plus, I was a Michigan guy anyway, so it was like I had to take a big leap of faith to move two hours south. But in the end obviously, it worked out well for me. I’ve been there since Fall of 2004. A long time and definitely have changed rules over the last years and — but its fun to see. I enjoyed kind of being the older guy on the team now and kind of mentoring some of the guys. If they actually listen to me, I don’t what they do or not. Yes, I know we got some fast guys now with Jake Riley and Colby Low on the team now, which is fun. It’s fun seeing those guys and seeing what they can do on work outs and thinking, “Man, maybe I can do some more stuff.” You try to tell them, once you turn 30, it’s all downhill. They don’t blame you, but yes, I know. Coach Jeff: Yes. Talk about your marathon progression in terms of when you first started the marathon, when you got into it, and how things progressed for you from the physical standpoint. Luke: Yes, I ran a marathon right away when I came into the program. I moved down to Detroit area probably August of 2004, and some of those — Brian and Clinton and Trent were already training for Chicago and I kind of just jumped on the train and was able to run the Chicago with them. I ran 2-18 high for a debut, which at that point, 2004 was a solid time. Americans are pretty weak in the marathon at that point. I think even that 2-18 was top 15 that year for times, top 15 or 20. It was definitely a significant debut. And then from there, I thought I was going to have a good one right away. The next year, I kind of took a step back and run Chicago again in 2005 and didn’t do very well, but definitely learned a lot of things about fueling and some of the more little things about marathon training. Coach Jeff: Sorry, I’m going to stop you real quick. What do you think that you learned in that year in terms of, what do you feel like you didn’t progress, talk about some of those little things that you felt helped. Luke: I think a lot of it was my own fault. I don’t think it was the training. Obviously, the training got me the 2-18. It was the same training that Brian and Clint were running there on 2-14 and 2-13. I think I stumbled along the way with just a lot of nutritional stuff on race day. That was actually my biggest problem because I had a lot of issues on race day with some fueling. I think I tried to hit a homerun right away. I tried to go from 2-18 to just smash it out of the park and I thought I was super good and realized that I still had a long way to go. In the end, I think it was very good that it happened. It happened when I was 24 or 25 and not when I was, where I’m at now. The years I have left are, as many as I have in front of me. I think it was good. I think it was good that that had happened. Luke: 2005 definitely — I ran 2004 and then I ran again in 2005. I didn’t run a spring marathon that year too. I actually went back to the track that Spring I believe. I did PR in the 10K — basically 20 flat in 10K that year, which was good for me. After 2005, bounced back and ran Boston in 2006. That’s where I actually had a big breakthrough because I was probably 2-15 shape to begin with and then I actually went out and did it in Boston and ran 2-15, two or 23 and then came back into 2-15 again in Chicago that year. That was a big year for me. But that was in 2006. I went from 2006 to 2011 without a PR. I’ve run a couple of 2-18s, but it was a lot of other things going on. You try to do some other things, try get back on the track. So it wasn’t necessarily just because I was having a lot of bad marathons. I did have a couple fairly bad marathons. I actually run 2-15, run 2-18 doesn’t seem like a positive step forward. I was in it, I mean, it’s hard to say too, because one of those 2-18s, I was eleventh overall in New York. Time wasn’t there but obviously, furthering your [inaudible 00:07:34] eleventh in New York. I was not like, again after anything. It’s hard to say. Coach Jeff: Yes. If you don’t mind, I actually have a question. How did you mentally kind of get through that process? That was probably a good three or four-year process where you weren’t hitting your marathons. I worked with a lot of athletes who struggle with that, their training, and I’m sure you worked with some too. Their training is going good and everything looks like it’s going to be a big PR, a big day for him, and then they get out and either something little happens or they just don’t perform on that day. How did you mentally keep coming back from that? What were you telling yourself? What were you working on? Luke: It was tough. I definitely struggled with it for a while. I would say the first – well, 2007, 2008, maybe that first couple of years I kept thinking, “well, I’ll just bounce back,” but then it started dragging on and on and on. You really start questioning yourself. You question the coach too. Like, “Maybe this is far as I can go with this.” I don’t know. So you do really struggle with it and you really try to find your way. In the end, it just came down. I had faith in what could happen. I mean, guys around me were doing the same thing we’re seeing success. I think the biggest thing that I learned from that was I kept trying to force workout and I kept trying to force things that didn’t need to be forced. I think if I would just let it, the natural progression of things take its course. I think I would have ended up being much better off. Maybe that drought would have ended up a little sooner. It is tough. It is absolutely tough and there’s no easy way to get around it. But I think in the end of the day, you just have to look at yourself and say, “Okay, am I doing the right things?” You take an honest look at yourself and take an honest look of what’s going on around you and hopefully you can find the right answers to those things. You don’t have to do that. Coach Jeff: Yes. That’s great to share. Like I said, I work with a lot of athletes and I know you do too. They struggle with that and hopefully, when they listen to this, they’ll kind of understand that sometimes it is part of the process. It’s not always a linear progression where every marathon, you PR and then – sometimes you go through. Luke: Especially the faster you get, too. It’s fairly easy to get something from four hours to three and a half hours, but to get them to three hours, and then you’re talking about some serious, serious things that need to happen. Sometimes you just need to be lucky, too. It’s tough. Yes, I mean, if you just know you’re doing the right thing and have that faith then it will work out. Coach Jeff: Cool. So now that we’ve uncovered a little bit about your progression in the marathon and understanding that. Actually, let’s talk a little bit about your coaching background too just to give some people a background to that. Talk about how you got started with it. You have your own business and type of athletes that you work with and those types of things. Luke: Yes, it started May 2006. I think I had my first client, but I kind of started with Kevin and Keith. They really just didn’t want to do the clinics anymore. Their kids are getting older and they want to spend more time with them. I just finished my Masters program at Oakland. I said, “Hey, take me. If you want this, you can take them over.” I was pretty reluctant at first because there are so many things going on, but I finally did. After I finished my Masters, I had more time. I jumped on board and started taking over, doing the clinics. The marathon clinics, I do every year for the Detroit Marathon. Coach Jeff: I feel you. Luke: But it’s fun. I mean, I like learning about that stuff as much as I like learning about physiology and biochemistry and all that stuff. It’s fun to take something and run with it and see how far you can take it. But yeah, as far as the athletes, it’s such a huge spectrum. I have guys that are low 2-20s, I have women that are in the 2-50s, and I have all the way up to just wanting to run one without stopping. It’s definitely a big spectrum of who I work with. The biggest struggle with that is I think sometimes people think, “Oh, you are 2-14 guy, you don’t understand what’s like for a four and half hour marathon.” They’re right, I might not, but I know that it probably hurts more than it would hurt me to run 2-15 in a marathon. I definitely understand that. I understand that time commitments it takes to train for something like that. It’s fun. It’s fun developing those relationships with those people. I mean, I coach about 30 people – mostly online. We do some local stuff now. Most of the people that I’ve known for years now, a couple of years, that’s what I like. It’s having those relationships with those people. At the end of the day, you’re a coach, but you’re a friend too. That’s nice. Coach Jeff: Yes. It’s amazing how you can develop that relationship even – I’m the same way. I’ve probably only met a handful of my clients that I coach. I still feel like I have a really close relationship with all of them. Coach Jeff: It’s definitely exciting when you get really – I mean, last week in Chicago, and I’m sure you had quite a people racing and, you know for me, it was just awesome to watch the track and watch people coming in. It’s exciting. Luke: You know how it is. I mean, you’re more excited to see them have a good result than maybe you are to have a good result yourself. That’s what I hope people get when they have a coach. I am genuinely excited for people when I get an email. I’ll say, “Oh, my gosh, I just PR by 10 minutes.” That’s exciting. That makes me realize and remember why I got involved with it, because it doesn’t matter how much you know about physiology or degrees you have or not. You can take somebody and just guide them. That’s the whole word, “Guide them.” I don’t necessarily want to hold their hand. I want to guide them so they know how to do it themselves and know how to do it themselves right and have them see that success is really, really fun. Luke: Yes. It’s hard though because after – the Spring was so rough for people. I was really worried about the cold. Luke: Right. I know. It was hard. You know it’s not going to go well for most of those guys. You try to balance between that, getting them too built up, or too down on themselves. It’s definitely a tough balance for sure. Coach Jeff: Yes. Kind of moving forward, what led you to write the Hansons book. Let me show to everybody again here. What let you to decide to write the Hansons Marathon Method? What kind of brought the idea about? Luke: It really just kind of fell in my lap. It’s definitely something I thought about for a long time. I think people in general approach Kevin and Keith about it, but I don’t think anything’s ever been official. We were on a plane and Keith was telling me, “Oh, I just got an email from somebody at Velo Press,” and they were throwing around ideas for books for the next year. Hanson name came up and he’s like, “There’s no way.” Kevin and I don’t have time to do this. There’s just too much going on. He’s like, “If you want to do it, I’ll give you the email and email the person back.” All of a sudden, there it was. I was in contact with Velo Press. I think at first they thought I was just some joker off the street and they were kind of, “I don’t really know about this.” Kevin and Keith [inaudible 00:16:22] for me and all of a sudden there it was. They’ve sent out a contract and all these stuff. Coach Jeff: Then it gets serious. Luke: “Oh, man, this is –“It happened pretty fast. Let me say this, it initially happened very fast. I started writing this in May last year and I think the original manuscript was turned in. It was in October. It was right before my wedding and so I really want to have it done before we got married. I’m sure my wife liked it too. I turned it in. I sent it in. Since then, it’s been just back and forth, fine-tuning and all these stuffs. The actual pressing of the book only takes two days. You did all this work and then all of a sudden there’s a book. I’m getting one in the mail. It really fell in my lap – it happens to be and it helps you. I coached a guy in a town close to here and he wrote a triathlon book for Velo Press a couple of years ago. Trizophenia I think it’s called, strange name. He’s a syndicated cartoonist as well. He’s got a crazy story. He and I were kind of throwing back and forth the idea of a book and then it was really like after I talked to him a week later, this happened. It just fell on place. Everything was there at the right time and it just happened. Coach Jeff: Now that we know how the process came about, let’s get started diving in a little bit to what the book is. We won’t give any secrets away. When writing this book, and I know there’s obviously some interest in it and partially it’s because— what’s the difference between what you feel the Hansons Marathon Method, how you coach, and kind of traditional marathon training plans. Where does the Hanson Marathon Method differ and why? Luke: I think, as far as why it’s different is also a reason why anybody can do it. But, I think, without throwing names out there, you have programs where a super long build-up, but it has to be a long build-up because the mileage is low, so you really take somebody who is doing 20, 30 miles a week maybe and then adding stuff to it slowly and slowly. Certain programs I’ve seen are 30 some weeks long. It’s just a really, really slow build-up. For some people, that might be what they need, but as far as the average person — you’re already running, I don’t see why you need that long to build up. I’m sure we’ll talk about 16-miler, but what I see a lot of times is you look at a program that has 20 – I’ve even seen 22, 24, 26-mile long on certain programs, but then you’re not doing anything the rest of the week. That’s kind of where Kevin and Keith are coming from with the program. The mileage itself is incredibly high versus more balance throughout the week. Obviously, you saw the schedules. You’re doing a fairly long tempo run in under week and you’re doing the 16-mile on the weekend, but you’re running six days a week so these other days are really aren’t that high. I mean 6, 8 miles during the week take away from the workouts. I don’t feel like it’s overly crazy. I’ve seen some people criticizing it online and stuff like that, but in the other hand I can point out 15 guys I coached who were businessman themselves or travelling pretty much all week. I got guys who travel to China regularly and Europe regularly and they’re running 70 miles a week and they’re fine. They’ve got families. They don’t have any problems. They fitted in. They just manage their time. Better not to say that other people don’t, but I think when you are that busy, you must better it at managing those things. You find out what is really important. Coach Jeff: Yes. I think one of the things too is – because I have the same thing. I’ve written articles where people are like, “This schedule is crazy. There’s no way somebody could do it.” I think the problem is people they set limits on themselves before they even try something. Coach Jeff: So they see a schedule like the Hanson schedule where it has you running five or six days a week. First of all, they don’t look at what those five. They just say, “Five days a week of running. That’s crazy.” But then, they don’t really think about – they just limit themselves and say, “I can’t do this.” Instead of going out and trying it. Because what I’ve noticed is that people always surprise themselves especially beginners with what they’re able to do. That’s sometimes the best part about working with beginners is that they – you work with somebody and three months later, they’re like, “I can’t believe I’m running this far. Like would have thought this is crazy.” That’s a part of the thing I think it is. I think actually the Hansons group themselves, I know one of the reasons that you’ve had success and that a lot of the athletes there have successes that you get there and you start training with an elite group. You start completely reframing your mind about what’s possible because before you go to the Hansons, somebody could say to you like running 140 miles a week is impossible, but then you go there and not that everybody at the Hansons runs that much, but everybody is putting in a ton of miles and everybody is running really fast and then it starts all of a sudden it becomes a common place that “Oh, yeah, I mean everybody runs 120 miles a week.” That’s normal and everybody runs 2-12. That’s normal. Not that it is, but that’s the mental process. Coach Jeff: Right, right. I think that’s probably a part of the reason that people have the – kind of look at it and the Hanson Marathon Method and think like, “Oh, that’s crazy.” They just haven’t conditioned their mind yet. Luke: You know how it is. I mean you see somebody who says, “I can’t run more than 30 miles a week and you start really looking into it and a lot of times what you see is, they’re just running everyday too hard. If they just backed off a little bit, they’d be able to run more. Some of that is just so misguided. I see that a lot. They feel like they have to run hard in order to get better. It’s not necessarily that way. I mean, yeah, it’s amazing what people – it’s nice seeing it when they do that. What they can do from there on. It is exciting. Coach Jeff: Yes. So let’s dive into that 16-mile. I know that’s – I think people have heard about the Hanson Marathon Method before. That’s probably what they think of. It kind of what makes it famous. Let’s talk about what’s the theory behind the 16-mile or I guess let’s just say more specifically the shortened long run and why 16 miles isn’t as magic number just like 20 miles is a magic number. Luke: Yes, absolutely. That’s the big thing. People say, “The 16 mile. Why is it 16.” It’s 16 because it fits better into the schedule. It makes it more appropriate to the percentage of mileage that somebody is running, but it is not about 20-mile here. I was actually thinking about this the other day when you got in touch with me. I was just looking at like – I started looking at Daniel stat. You start looking at, who else, [voice overlap 00:25:12]. What’s that? Coach Jeff: Probably [voice overlap 00:25:15], yes. Luke: Yes, all those guys. You start looking at all those guys and all their stuff and even [inaudible 00:25:21] and things like that. Those programs weren’t for the average runner. They were for elite runners. And you start really looking – oh, Renato Canova is another guy I was looking at. It’s funny because Canova basic badge is ledger, but if you look at their program, it’s the same thing. It’s just different names. Anyway, the thing is, all these stuffs are for elite. Really first designed for elite runners and you start looking at what people focus on. They focus on 20-milers and they fail to see what they were doing the rest of the week. You look at some of the workouts these guys are doing. Like Canova’s guys are doing like 5x5K ridiculously fast paces. In the average person, they’re not going to do that. Cut that out because I can’t do that, but I can do 20 miles, so I’ll keep that in. Everything has to be in balance to what you’re trying to accomplish. I think honestly, back in the day, Kevin kind of settled on 16 just to be kind of throws in your pace. It doesn’t matter what number it is. It could be 14 for somebody. I don’t know. We really started talking about it and you start looking at – even Daniels says in his stuff, you get patch passed three hours and you’re not really the physiological stuff. You’re really doing more harm than good. You’re damaging yourself so much that it’s going to take a long time to recover from that. If you take somebody who runs a 20-miler, let say, a four-hour marathoner going on to a 20-miler, you can be out there in three plus hours sliding through a 20-miler. So honestly, they probably are going to have to take a couple of days before so they’re going to miss some running. So Friday and Saturday pretty much don’t count on it. And then they run Sunday and do a long run and Monday, Tuesday, Wednesday, they’re so beat up, they can’t do anything. Now, it’s Thursday where they might be able to do something of quality and then they’re going to take Friday and Saturday [inaudible 00:27:32] 20-miler on Sunday. You really get pass the point of training and now you’re just surviving weeks. You’re surviving 20 miles, [inaudible 00:27:41]. That’s really what the whole point is. You can back that off four miles, get into that two and a half to three-hour range for slower runners and two hours for faster runners, maybe a little under and you’re fine. You’re getting the development. You’re getting the physiological stuff. Anything over 90 minutes you’re getting that development. Why don’t you back it down to where you can manage that and then still not have to take off time? You don’t have to take Monday and Tuesday off to do something on Wednesday night. You can do something on Tuesday because you’re not so fatigued that you literally can’t do anything. I think that’s the biggest point with the schedules that Kevin wanted. Because you know how it is. I mean people focus so much on that 16-mile, but they fail to see that Thursday before they ran a 10-mile tempo, Friday they ran, Saturday they probably did a 10-miler or 12-miler and then Sunday do a 16-miler. They’re doing a lot of running before that 16-miler then they’re bouncing back on Tuesday and do another workout whether it be a speed workout or strength workout. You’re not really tapering or recovering to do a 20-miler. You’re training through everything that you’re doing. That’s kind of the whole cumulative fatigue thing there. It’s not one thing that’s going to kill you. It’s just all of it is the end. Coach Jeff: Yes. And one thing I noticed looking at the schedules and this is what I tell athletes who I don’t—we do short long runs with is that, look at the entire week of training and look at the quality compared, look at the total number of quality miles run in comparison if you use a Hanson schedule and you say you have the 16-miles, which is pretty quality. Some of it is going to be up tempo. You have the tempo run. During the middle of the week you have the speed workout. You added a lot and you’re talking 20, 25 miles worth of quality running and then you say to somebody, “Well, let’s look at what you would do if you did just kind of nutritional schedule if you do a one 20-miler, but you usually have to do is so slow because you could barely finish 20 that it’s not really quality. It’s just time on your feet and then you can’t really do anything else during the week. Maybe you get one session in, so you’re talking about maybe 10 miles of quality running. When we talk about quality, maybe half marathon pace to marathon pace. You’re talking about now you’re doing half the quality through the week and I think that’s we’re talking about. That balance where you’re actually doing more. You’re just not focusing so much on one specific run. Luke: And that’s why they need such a longer build up because they’re doing half as much. It’s not going to – they need more than 12, 14 weeks. They need 24 weeks. They need 32 weeks. They need a super long time frame because it takes that long for the body to adapt to something, because you’re not getting the stimulus that the other guys would. Coach Jeff: Let’s talk about, I know it’s in the book and I won’t grill you on the specific numbers, but talk about a little bit about the scientific background of why you don’t necessarily need a four-hour run. Talk about the aerobic benefits. Where do they stop? Where they start? Along those line. Luke: For everything I’ve seen, 90 – you kind of have two metabolic windows and once about 30 minutes and then the other one is a 90-minute. If somebody wants to do an afternoon run, they should try to make it 30 minutes to get that stimulus. On the other side of that, they’re doing a long run, 90 minutes is probably the minimum they want to be in order to start seeing those long run adaptation and then everything else. Then you have that window of 90 minutes to about three hours is everything I’ve seen. So that’s why it doesn’t make sense for a lot of those people. If they’re going about three hours, they’re not getting the adaptations — they’re not in the optimal window. Even if they can recover from it, they’re still past the point of not getting optimal development. They might actually be doing more damage long term than good. Really, to me, it just makes sense to stay in that optimal window, maximize your training and then you can focus on a marathon-paced run. Because to me, that 10-mile tempo that they do for three or four weeks, you got to warm up and cool down to that and you’re talking 14 to 16 miles anyway. So to me, that’s just as important if not more important than just a regular long run anyway. At that point, they’re spending a long time in a marathon pace. They feel uncomfortable in marathon pace. They’re developing few utilizations that are maximizing burning fat and they’re energy stores are much more balanced. It makes more sense. To me, that’s way more important that just going through and running a 16-miler even if it is two or three minutes slower than marathon pace per mile. You’re going to get some real development, but you really want to make sure that you’re in that window. Coach Jeff: Right. Yes. I always tell people after three hours, there’s a diminishing return and there’s an increased risk of injury because your legs are getting so tired and then obviously the recovery on the back end. After three hours, you’re really not getting anymore aerobic benefit than you did at two hours and 30 minutes. But you’re definitely increasing injury risk, so why keep going. Why not stop at the good stuff and then leave the running for a better day. Luke: Right. Absolutely. The other thing you have to look at too is a lot of the runners we work with, they don’t have – they have a coach going beside them and giving them water bottles every three miles. I think that’s a huge part of it, too. You have to maximize. You can be depleted for these runs and if you stretch it out so long pass three hours, then you really running the risk of becoming obviously dehydrated, but just really burning those fuel source is so low that the body kind of goes into protective mode. It’s like, “Shut things down now.” You really want to avoid that. You have to look at the practical side of it too. It might not be possible because you’re not going to be able to – you don’t want to put so many goose in your shorts and then you’re out. You really have to look good. That’s part of the things that you struggle as a coach. You have to make sure that – just because you can’t see him, you got to make sure they’d still be doing those little things like the fuel and stuff. A lot goes into scheduling long runs. What I tell people is, “Think about where that started.” To me, that started in the 1970s when there was mini boom with the Bill Rogers and Frank Shorter where the average marathon finisher was like three hours. So guys were running six-minute pace in training all the time and so all these exercise scientist and coaches came out and said, “Well, glycogen runs out at two hours, if you do an easy 20-miler for a guy, that’s a 2-33 hour guy, that’s like a six-minute pace.” Boom, you got 20 miles. Nobody’s challenged that since things have changed. The second marathon boom where now people are running 3-34 hours average and that’s completely changing their energy system. Luke: Absolutely. Those guys are running a lot more mileage per week. Most of those guys, the average mileage is a lot higher, I would suspect too. You read about all those guys – just average guys working 40 hours a week, families, and stuff like that. They would still run 100 plus miles a week. Just because, again, that’s what those guys were doing. That’s what Shorter was doing. That’s what Rogers was doing. They were just emulating that. Yes, it’s definitely changed. We did some stats in the book. You can go on Running USA. They have some really good stats for marathon and stuff. I think they have stats going back in early 70s where 15,000 people finished a marathon. In 2012, it was almost 600,000 people finish marathons in the US. It’s a huge growth, but along with that growth, the average age the marathoner got older before it was in the 30. Now, it’s in the 40s. Along with that they average time, but that’s good. In the long run, that’s good because more people are involved in the sport, which is what we ultimately want. But it’s definitely making people look at training differently. But again, that’s what spurred the market on. The minimal training plans too are that, listen, and told somebody who was 45 years old and didn’t want to run a ton of mileage, “Hey, you can do this.” We know you can, but it’s going to hurt really bad too. I think if you put the work in now, you suffer and do 18 weeks of training now and you kind of sacrifice some social things in your life for a few weeks. The payoff is much, much better. The better experience you have with it, the more likely you’re going to be involved in the sport for a long time. To me that’s more important than just running one and not doing it again, but that’s here or there I guess. Coach Jeff: Continuing on the theme of balancing the training, looking at the Hanson Marathon Method, the workouts, looks like each week you touch on a different energy system – at least once a week, speed, the O2 max, kind of stuff, the threshold, and then obviously the long run. What’s the advantage of touching those energy systems throughout the entire training segment each week and never getting too far away from one? Luke: I think just thinking of the advanced schedule off hand, it starts right away into speed, and we do I think eight or so weeks at speed and maybe a couple more. Honestly, that I think was more out of practicality than anything because these schedules that Kevin and Keith made were first designed basically for the Detroit Marathon in the fall – so an October marathon, which mainly you had to start training in the summer. A lot of those guys were running 5Ks and 10K. There are some road races during the summer. I think we were thinking, “Okay, how can we train for a marathon, but still allow these guys to run this local road races through June, July, maybe [inaudible 00:38:31] in August and then switch over to marathon training program. Talking with Kevin and Keith, that’s basically the impression that I have on that, but – and it does. Honestly, I think its fine. When you look at typical [inaudible 00:38:50] you took a lot of these guys. These guys will say, “Well, we’ll start out with slower stuff and then you build to the faster stuff.” I was reading some stuff on [inaudible 00:38:58] and he would say, “Well, I’d get guys up to where they would do 10K and maybe 5K intervals the last few weeks for a marathon segment.” After training for 10 marathons, I can’t imagine running 5K stuff, 10K stuff last couple of weeks of a marathon. Coach Jeff: Right, it doesn’t make sense. Luke: To me, the practicality that it isn’t necessarily makes sense. Admittedly, [inaudible 00:39:21] he’s like, I would just jump off the ladder X point wherever you felt comfortable. I think, even he realize, “Okay, maybe you don’t need to do this stuff later in a marathon segment.” To me, why not do it in the front of the segment. Because a lot of times, these guys, they’re not training very hard. Even if they’re doing 5K stuff, 10K stuff, it’s not as fast as what it could be because they’re not ready to run superfast. A lot of these guys, they’ve never done intervals. They’ve never done things like this. To me, why not have them mess it up in the early summer where it doesn’t really matter as long as they’re doing something that’s all that particularly matters. To me, that makes sense and then they can still do these things and you get a lot of people, they just want to run on marathon they’d never run anything before. This actually gets some fairly in shape to do something shorter so that they can run like a 5K or 10K and then you can base what you want to do for the marathon off of that and then you’re going to switch for the marathon specific stuff with the strength and the longer tempo run. I think that’s why we — pretty sure that’s why the speed stuff is more on the front, but then yeah, you switch over the strength, which is really not a whole lot faster than marathon pace. But it’s deceiving because a lot of people say, “Well, you’re going to run 10 seconds faster in marathon pace per mile, but you’re doubling the volume, too,” and that’s the other thing, the speed too, the volume, three miles worth of speed and the early part of segment. As a percentage wise, it’s not very high percentage of the weekly miles too so you don’t run the risk of — you don’t have that super high risk of injury because the volume of it is so low, but then the strength, you obviously double that volume and then it’s more marathon specific. But you’re right, you’re touching more like threshold stuff over there and by that point, the marathon — the tempo runs are eight to 10 miles so you’re really more a high aerobic pace under. You’re still underneath like a threshold and you’re just — you’re running at a high aerobic pace for over an hour for most people. So yeah, you’re right, you touched on a lot of stuff, but the speed stuff, you can say, “Well, it keeps turning over up a little bit too, like it’s feeling a little bit fresh,” and then the tempo runs obviously are just — you’ve kind of seeing marathon pacing and the long runs are in the higher end of the spectrum for the mileage. So yeah, we definitely touched on everything and I think having that balance is key especially — again, I go back to the long-term development. Having that, you know how to use — you’ve seen those training pyramids where the bottom of the pyramid is the easy running. When you get to the top and it’s being too maxed up. Well, a lot of times when you’re doing a small — a three-day program or something to that effect, all you’re doing is focusing on the stuff at the top of that pyramid. You’re not focusing on anything at the bottom of the pyramid. So again, short-term, that sprint, because you’re developing that high-end stuff right away, but there’s only so far you can take that without — you have to go back to the bottom, push that foundation up and then you can handle more of the faster stuff. So having that balance I think allows that. It allows them to handle more mileage initially and then you can go back to other things when you’re done with the marathon. I don’t think the program is good for somebody who wants to just keep running marathon after marathon after marathon. I think you really need that break and then you need in marathon and then maybe do some halves or something — back to some short road race is an [inaudible 00:42:39]. Coach Jeff: Yeah. When I looked at the speed, that was one of the things that I thought was really great about the program is that — from what I see, what happens is people do just what you said, they shouldn’t do is they run marathon after marathon after marathon. It’s just every 10 to 12 weeks, they’re running another marathon and what ends up happening is they just do the same training over and over. It’s just threshold runs and long runs, which are good. Those are definitely the foundation of good running, but what ends up happening is after two or three years, you haven’t touched your speed. You haven’t touched your VO2 max. You haven’t touched those high-end anaerobic type training events. And then all of a sudden you’re just — it’s like I always — I tell people, its like, “Oh, trying to open a window blind.” When you have two of the pulley strings, you can pull one side and one side will come down, but it will never get to the bottom or it will never get to the top because you can only pull one side so high. That’s what I see when you do the speed work is that you’re really balancing things so that way, when you pull the pulley strings, everything kind of goes up at the same time and your ultimate ceiling is a lot higher. Coach Jeff: So I think that’s why one of the things I think it’s a great addition to the program and to be able to balance all those energy systems within a training cycle. Luke: Absolutely, yeah, and then you go and touched — talked about things like fiber recruitment and things like that were exactly. Somebody does all long runs in marathon paced stuff. They never touched on type 2b fibers or even that fast twitch fiber. It just never — those things — and they shut down your body. If you’re not using, your body is going to shut them down and more you have those things. I mean you talked about hitting a wall, what you could really help yourself with is if you get those intermediate fibers and those fast twitch fibers used a little bit, your body can go on those. The force production in your slow twitch is going to decline. You get to a point when you’re going to decline. It might be 18 miles or might be a 24 miles, but you haven’t touched on those fibers. They’re not going to be there to help you, but if you have, they might be — will get you the rest of the way in and that’s one of those things that a lot of times are just completely never even — they’ve never been thought about in those types of programs because they just know — the only goal is to get them to the marathon finish line and they don’t really necessarily care how just as long as they can. Coach Jeff: Yeah, exactly. So this is a question that I’m excited to ask you only because I love to hear your experiences. What are some of the biggest training mistakes that you see with a lot of the athletes that you work with or that approach you at either about the Hansons Marathon Method that want to work with you? That’s something that I struggle with a lot, but I think the biggest thing is you can get people to back off their intensity a little bit. Because a lot of times because we talked about early, I get a lot of people who think 30 to 40 miles a week is the most they can run and it’s not a matter of ability. It’s a matter of just — they — for instance, I just got an email from a young woman who runs six days a week and she does every other day, she gets on the treadmill. She just does intervals as hard as she can for 30 seconds on and 30 seconds off. And then the other day, she runs six miles a day at 90 percentage of her heart rate maximum. Coach Jeff: Right, that’s why I can’t even do that. Luke: Somewhere because you’re fat, you’re really fat. So that was a big thing and now, not to that extreme, but that’s a lot of the types of thing I see and honestly — but I think it goes back. They’re just — a lot of them — this education about what you really need. So I think that’s my job as a coach to educate them as, “Now, this is what you really need. This is how you can do it.” As a science guy, I hate those — the testimonials and stuff, but as a businessman, you need them because you’re only as good as the people who’ve had success with your program. So, I can talk about journal articles all day long and it doesn’t matter to people, but if I said, “Bob ran 15-minute PR Chicago doing this and he’s been trying 10 years to break three hours,” that means something to them, to that person. So yeah, I mean, but it’s hard and it is hard because people are used to doing things the way they’ve been doing. I mean, it’s hard for them to change and then the coach that get frustrated, “Why are you paying me this money if you’re just going to go back to do whatever you were doing anyway,” but sometimes that actually wakes them up. They’re like, “You know what, you’re right.” That’s the only time that I just get mad, but you’ve got to be honest with them and say, “Listen, at some point, you’ve got to trust me on this and it’s going to be — it will be fine and if not we can reevaluate later on”, but you know the struggles. Luke: Yeah, absolutely. Some days, that’s a [inaudible 00:48:43], yeah. Luke: It wasn’t — most of the time, that’s where they’re suppose to be anyway like the only crap, but it’s not — then you just say, “Yes, that’s fine.” Because it’s absolutely fine. It doesn’t matter about [inaudible 00:49:15] I was telling, but there’s a day — I mean, I’ll adjust things for people. If I’ve been working with them for a long time and like, the one thing you can adjust pretty easily is marathon. There are some long runs for the marathon and sometimes, they really just can’t run more mileage. It’s too time constraints and things like that, but that’s completely understandable. So what we’ll do is we’ll do some different long stuff, like we’ll do some of the fast finish longer or we’ll do — like a tempo run and a long run. I’ll do a [inaudible 00:49:46] in the middle of the long run and just something to change things up for them, too. So that’s something I feel like as a coach, I’m getting a lot better at doing it so it’s just making sure there are some variety in their form and then honestly, that stuff is going to be tremendously help because I mean, it forces you to break up you on and on and it gives them some bearing intensity. Coach Jeff: Yeah. So last question before we kind of let you go, but I love asking this question. In your own training, if you could go back five to eight years, probably 2005, 2006 and tell yourself one thing, what would that be and why? You ultimately just adding on more and more and more to your already fatigued systems and it just probably overtraining for so much that it just — and setting myself back. Literally, probably a couple of years so that’s the biggest thing– I think — I don’t mind trying to swing for that homerun, but if you don’t get it, you really need to take a look at why you didn’t get it and then you really need to say, “Okay, I ran 2:18, I ran three hours,” or whatever the case is and say,”okay, what do I really, really think I can do and that’s what I need to focus on.” So I might be saying, “Okay, let’s not try to run that 2:40 marathon. Let’s back it down to 2:50.” Honestly, I have a better chance of running maybe 2:45 off of that then completely overtraining for a 2:40 and being overtraining going to the starting line if you can make it to the starting line. So that definitely I think that’s the biggest thing is being patient and again, I didn’t see the short — I was seeing the short-term and not the long-term and ultimately, it caused me to long-term. So I think you really do need to learn that patience and not be so — it goes the same thing as like, “Why do people running on a lot easy runs faster,” because they think this is going to make them faster faster. They’re going to get better quicker and it doesn’t. It also might sets them back further. In a short-term, that might be fine, but in a year or two, it might not be where they want to be. So I really think that would be the thing and going on to that patience thing a little bit more, I think just picking and choosing the days you really want to hammer. You know how wasn’t guys were here so it turned into a big — a mess sometimes. Luke: Everybody is out there swinging in and they were going to see the last man standing as in and sometimes that’s fine and other times, you’re going to say, “Hey, this is not the day for me.” I think — and now, and maybe just because I’m older, but now I know. I can look at the schedule I get from Kevin and Keith and say, “Okay, this day, I’m going to — there’s going to be a lot effort into this.” And then the other day, I’m going to be like, “Okay, this is — I’m just trying to get through this, get through this as just little damage as possible and then move on.” I think that’s the key to it. Especially on a longer segment like that because it’s just — if you try to hammer on everything, it just not going to work out. It just ends up being rough. Coach Jeff: Yeah, that’s a good point. Coach Jeff: Cool. Well, Luke I definitely appreciate you taking the time here. A little bit more about the book, where can people pick up the book if they want to get a copy? Luke: Amazon, Barnes & Noble, indie-press.com, there’s a couple other websites you can get it from. Coach Jeff: Okay, so what we’ll do too is we’ll link this up at the bottom of the show notes for anybody that’s listening on the podcast, visit the Runners Connect website, go to our blog and visit videos and you’ll see the video and we’ll put some show notes up. But for people that don’t know, it’s this book here, it’s Hansons Marathon Method. So if you’re going to look it up on Amazon and A Renegade Path to Your Fastest Marathon and again, it’s Luke Humphrey is the author. So yeah Luke, again, we appreciate you taking the time. I know you had a busy day and I appreciate you taking the time and sharing with us. This is a great interview. I’ve got a lot out of it. I know my audience is as well so I appreciate it. Luke: Oh, thanks Coach Jeff. It’s a good talk. The interview was good but little long. Funny, I thought it was too short. I felt like there were so many facets I could have dug into that I didn’t I am still trying to improve as an interviewer. What parts did you think could have been cut or did you feel were not useful? I thought each question/answer was very helpful. I picked up the book 2 weeks ago. I’ve only been running since January after losing a decent amount of weight, took on some 5k, 10k, 15k races and did a half Marathon distance in training; Then my wife signed me up for the Disney Marathon this coming January 2013. So I’ve been working on my mileage using some free canned plans off the web, that got me to the half Marathon distance, but something to me seemed to be missing. It just didn’t make sense to say go x miles one day then x more the next with rest days. There just wasn’t enough detail around pacing or endurance building. This book seems to have answered the lingering questions. I’ve began using it starting at week 6 of the beginners program since my mileage up to then pretty much matched up to prior weeks. We’ll see how it goes, but I like the specifics I’m to follow. Since I don’t have a PR at this distance, I’m just using the metrics set based on some prior distances I’ve raced and will hope to come in under 4 hrs – which to me is optimistic. I have a friend that is running the same race in January, but he is following one of the more traditional 20 mile peak plans. We’re both first time Marathoners so I’m really interested in seeing how we each look back on our experiences; Good times either way, but definitely different. Thanks for the comment, Wes and I am glad you enjoyed the interview. Hopefully, it helped add some detail and background to the book and your training. Sounds like you have a great plan and I have no doubts that the consistency you’re stringing together week after week will get you through the race strong. Definitely let us know how the race goes and how the experience compares to the traditional plan your friend is working with. I found the interview really interesting as I had just come off my 2nd marathon with an improved time (over 8 mins) and yet I missed 6 weeks training in the build up due to a torn hamstring. I was up and running in the final week of August for a marathon on October 21 . I did one run of 20 miles 3 weeks out and another of about 17 miles but by chance, I managed more “brick” sessions where for instance I would do a fast 5k (20-21mins) on a Saturday in race conditions and then a hilly 12miles early on Sunday. On another occasion, I ran a hard, hilly off road 10km race in 44-45mins, went home had a recovery snack and straight out for a slow but hilly 12miles. Without realising it I was following Luke’s ideas and as a Vet aged 63 I improved my marathon time to 3:24:12 (Abingdon UK, October) from 3:32:13 on debut (London Marathon, April 2012). Thank you for sharing your experience, Mike. Sorry the experiment had to be the result of an injury, but I think you’re right. The unintentional focus on not beating yourself up with the long run and focusing more on the workouts and the total volume of running helped you succeed. I encourage you to pick up a copy of the book. Hopefully, it can provide some good ideas for Boston. Best of luck! One point that bugs me though is use of the term Quality Workout. and Excluding Easy Running from that. IMHO a Quality workout is one that really hits its target on the head. If the plan calls for an Easy run and you actually do an Easy run then it WAS a Quality workout. Just as if your plan calls for 6*1000m @ 3:45 and you do the first 3 in 3:20 and the last 3 at over 4:10 then that was NOT a Quality Workout. Whether a training plan should have lots of Easy running or less but more intense running i think really depends on the individual athlete,what they enjoy and what they can tolerate. Good point, Paul. I think it just comes down to the term quality having two definitions or meanings. In this case, quality refers to a harder, faster workout. I think you’re definition of quality (is still right) is more along the lines of effective or beneficial. You’re absolutely right though. A well-executed easy run is very beneficial. It helps promote recovery and aerobic development. More importantly, as you point out, a speed workout isn;t as effective if run stubbornly. I’ve been using the Hanson’s plan as training for Chicago this October, and have followed the guidelines in the book to add mileage- last week hitting 77.5 miles, and in 3 weeks will likely hit 80 for the peak week. Love the plan, it’s been going great so far! I might race a half marathon on Sept. 8th as a tune up race 5 weeks before Chicago, but it might mean missing the prior Thurs quality workout (14.25 miles with 9 at MP) as well as the following Tues quality workout (strength workout, 2×3 mile repeats). Any thoughts? Is it worth it to race the half and potentially miss 2 quality workouts, or should I skip the half and stick to the plan?